Yesterday on QUILTsocial I shared with you 7 crafty ways to embellish quilts with Razzle and Dazzle thread from WonderFil Specialty threads. Today we’re going to get our machines ready to do some bobbin work. 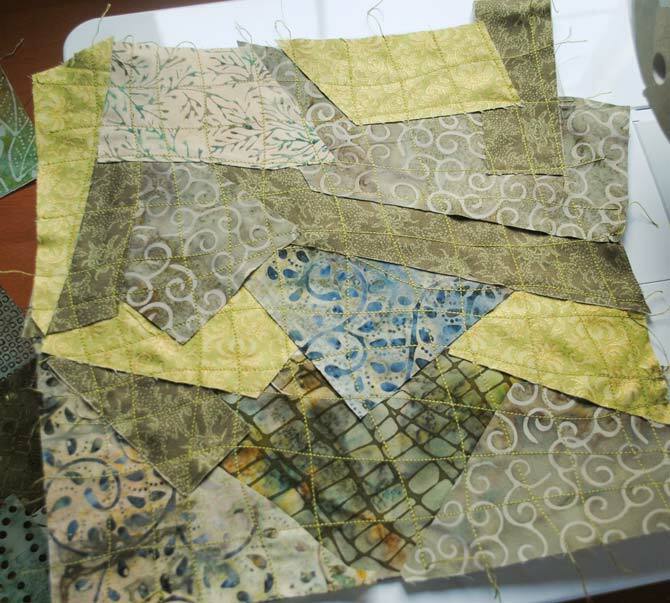 I’m excited to try this technique as I’ve seen lots of beautiful quilts embellished with bobbin work, but have never actually done it myself. 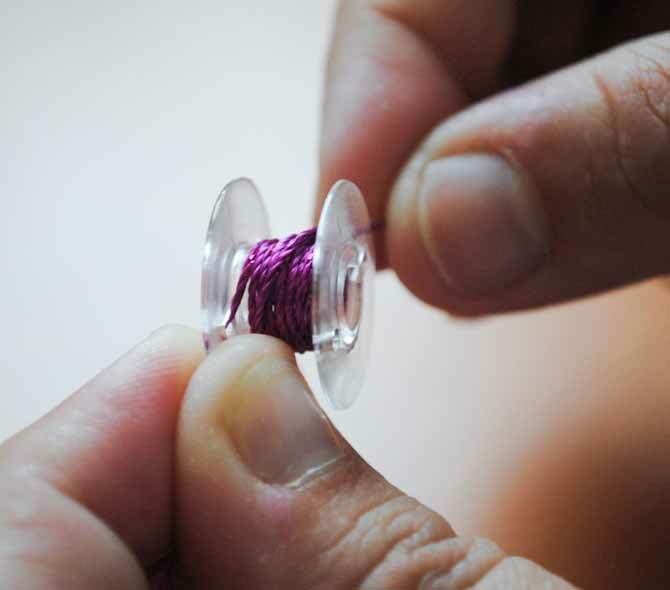 Instead of sewing on the top of the fabric, you work from the back and let the bobbin thread be the star! You can create designs, which give a three-dimensional appearance to the surface of the fabric, by winding the bobbin with heavy weight thread or ribbon too thick to be fed through the sewing machine needle and sewing on the wrong side of the fabric. Since I wanted to try doing bobbin work with my new NQ900 from Brother, I emailed the company to ask what type of equipment I would need. 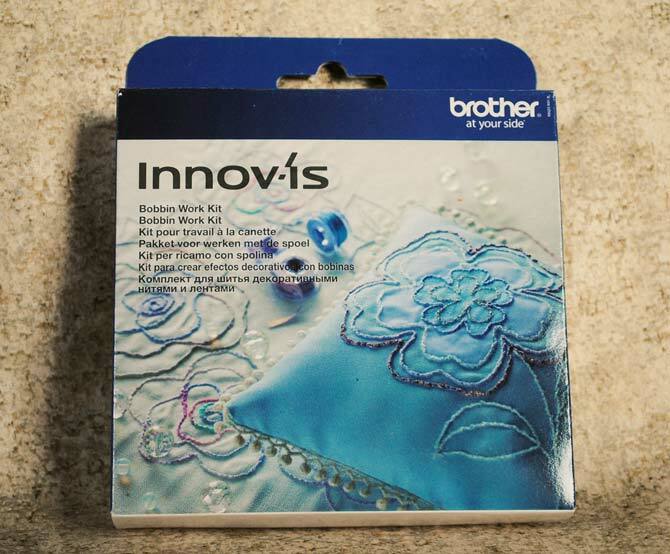 They were so nice to send me the Innov-is Bobbin Work Kit pictured below. 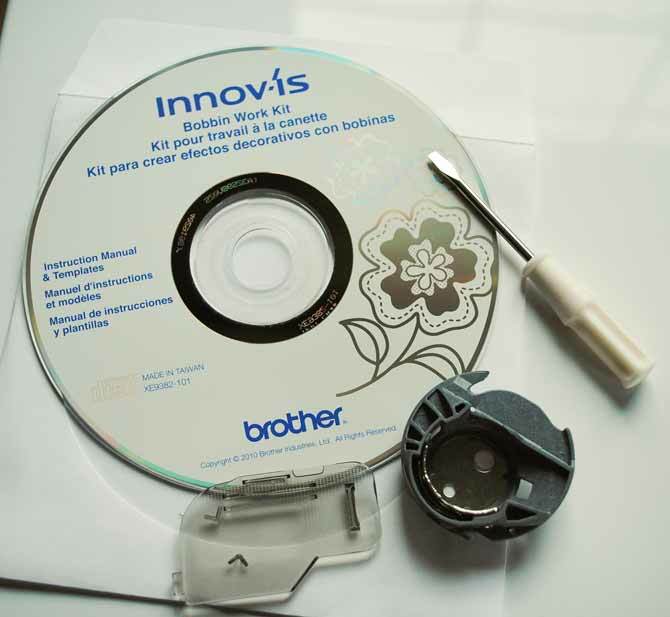 The kit comes with a special bobbin work bobbin case (which is gray instead of black like the regular bobbin case), a special bobbin cover, a small screwdriver and a CD-Rom which has the manual in English, French and Spanish. I printed out the manual, since I wanted to be able to have it right beside my machine in case I got myself into trouble! 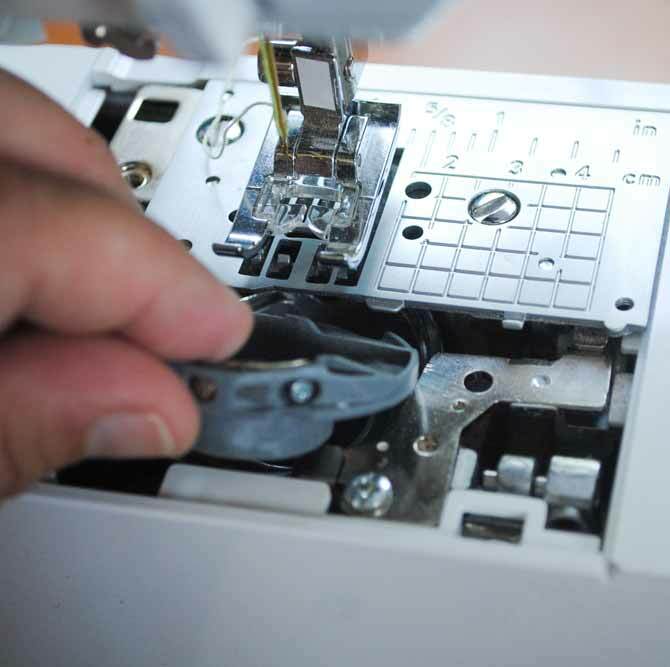 Depending on your sewing machine, you may need to change your usual bobbin case for one that is made specially for bobbin work. For my machine, all I had to do was remove the needle plate cover, remove the black bobbin case, clean the area with a brush or vacuum and then insert the gray bobbin case. 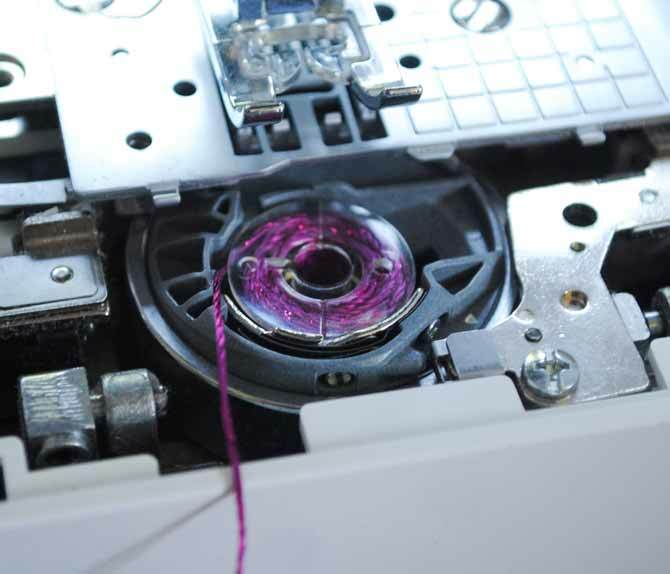 Check your machine’s manual to see how to prepare your bobbin case for bobbin work. To fill your bobbin, hand wind it slowly and evenly with your decorative thread until it’s about 80% full. Try to wind it so that the thread is snug and not twisted. Trim the beginning tail of the thread as close as you can to the bobbin. 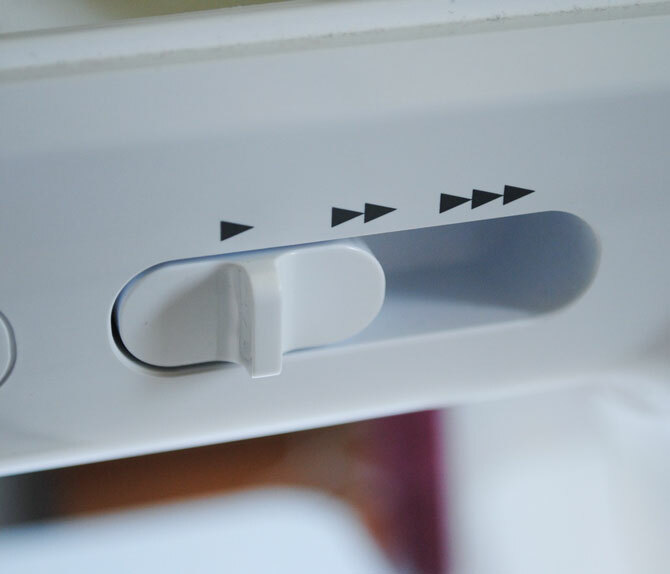 Following your machine’s manual, insert the bobbin and pass the thread through the tension spring. Select a thread that will compliment your decorative thread and use it to thread the upper machine and needle. 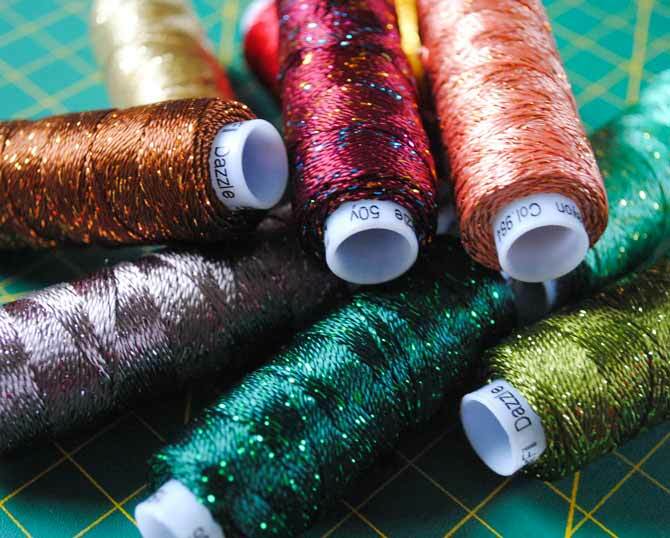 You can use monofilament, cotton, polyester or rayon thread in the top – whatever your heart desires! I chose a thread close in color to my Dazzle thread in the bobbin. Hold onto the tail of your upper thread and using the hand wheel on the side of your machine, lower the needle down to catch the bobbin thread and bring it up to the top. If you can set the speed on your machine, set it to the lowest speed possible. This will allow you to have the most control while stitching. Use a lightweight tear-away stabilizer such as HeatnBond on the wrong side of the fabric. 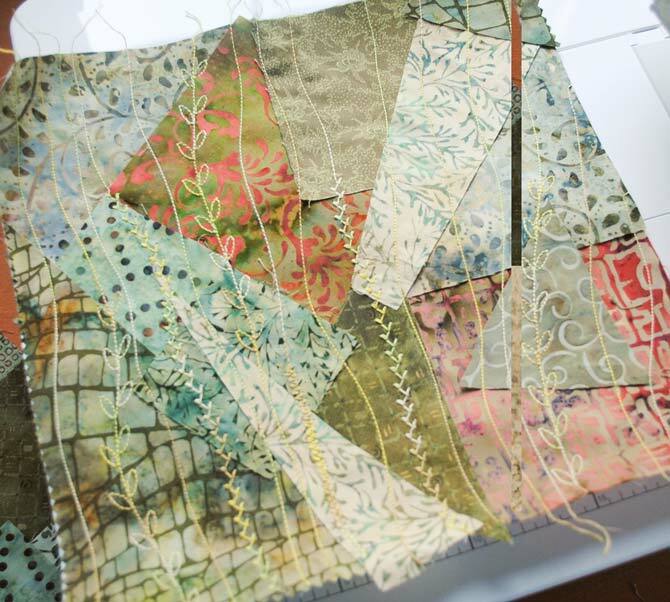 I decided to make a crazy quilt background for my stitching by placing a bunch of fabric strips and scraps on top of the stabilizer and then stitching them down with Fruitti thread. I used some of the straight stitches and some of the decorative stitches on my machine to make two different stitch samples. Now that my machine is all set up and my stitching bases have been made, I’m ready to try bobbin work. Come back tomorrow and we’ll see the Razzle and Dazzle threads in action.